The extruded aluminium enclosures of Gainta’s ALUG7XX series are available in different sizes, with lengths suitable for indoor desktop device or outdoor wall-mounting junction/control box use. 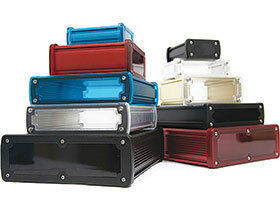 Five standard colours (gold, silver, red, blue and black anodised finish) and modern aluminium bodies with either plastic or die-cast aluminium end panels are offered. A recessed area of 0,5 mm in depth is designed into the top, in order to affix a product label or do silk-screen printing. Optional continuous rubber seals designed to meet IP66 rating are offered when customers need to install in the cover and use the enclosure outdoors. Black coated, die-cast wall mounting kits are also available, in addition to a 1,6 mm inserted PCB and PCB stoppers.